Guns won't affect the rating of Minecraft. Does minecraft really need guns!? Is there not enough violence in this world already? Right-clicking would ready it, and releasing it would fire a dozen bullets in a randomized cone. A bullet would deal 4 damage, or 2 hearts. Reloading would be identical to that of the musket. As with the musket, removing it from your hotbar would unload it. Yes, minecraft DEFINITLY should have shotguns! Since when do bows have an enchantment that increases firing rate? Also, the Stopping Power enchantment functions differently, increasing damage in fixed amounts, rather percentage increases. Explosive Rounds would give the bullets a 10% chance to explode on impact with a surface, dealing as much damage as a Ghast fireball. For each level the chance would increase by 10%, the maximum level being 5. Not sure if that sounds a bit OP. They're too modern for his wittle arpeejee brain. I don't think he was opposed to the idea of guns in general, but shotguns specifically. I actually don't think he was disagreeing. Isn't he the one who wanted more modern guns? Also, I was noticing a number of different topics for new bows or changes to archery, today. That seems to suggest that, even if not specifically calling for firearms, people are looking for changes to ranged combat, which a firearm could potentially provide. Oh, yeah. That's true. I never really thought about it that way. I feel like most people are going to look towards Crossbows, which I honestly find extremely boring. It's a bow and arrow on a stick that is activated by a mechanism rather than your own force, and has been related to a medieval anti-tank missile in documentaries. Crossbows were some of the ultimate in home defense; Ballistae - mounted crossbows for those unaware - even more so. I've seen people left and right saying Minecraft comes across as Medieval...so I see no reason we shouldn't have crossbows. They would be more powerful, but slower, than bows, by nature of how they work. You load a bolt; You fire a bolt; You reload; You fire again. They are not all that fast; It's not like a bow, where the second you fire you can notch another arrow in place, draw back, and fire again. You have to stop, load the bolt, reset the string that propels the bolt forward, get back to firing position, aim, fire, and repeat. People want crossbows because it isn't hard to balance them, and they do fit. I personally agree with them; Crossbows are the next logical upgrade, and maybe guns later after that, if only "older" guns, like the Blunderbuss and a Flintlock pistol. Ooh, I like the idea of a mounted crossbow alongside guns! It could be a stationary but aimable semi-automatic ballista that holds around half a dozen bolts. They could all go together for an awesome defense/combat based update. The best way to implement guns is to make it a gamemode where - like the better than wolves mod - you have to advance to a certain point before you can make certain things. A mode with a set flow of play - focusing on advancing and upgrading from the wood-and-stone-tools to smelting rocks for ores and refining them, discovering more advanced forms of power and inventing machines...and yes, somewhere in there, guns. This would be amazing on multiplayer - would bring a whole new side to faction servers in particular. One faction is the main exporter and supplier of certain weapons, and builds factories instead of bases. Because of this, that faction is made peaceful - they only sell weapons to others, just a middleman. Does it working like that sound like a fair way? I wouldn't go with semi-auto. That's not how ballistae work. It's literally a crossbow on a mount - No faster, just stationary and meant for home defense. The size might give them longer range, though, and a slot that autoloads bolts for you if stored there - perhaps crafted with a hopper in the recipe if put in, to simulate that? Anyway...Ballistae are akin to tripod machine guns...minus the machine and rapid fire bits. They're immensely powerful, capable of shooting a man off a horse if I recall right. Easily powerful enough to OHKO someone without armor if in Minecraft. Actually, guns are very medieval, traced all the way back to the 13th century, albeit simply iron tubes on sticks that were fired by a separate fuse, and very late in the medieval ages actual shoulder-fired muskets with a trigger mechanism were made. I don't think a wheel-lock or even a flintlock would be too anachronistic for Minecraft, especially since Minecraft really has no set time period. 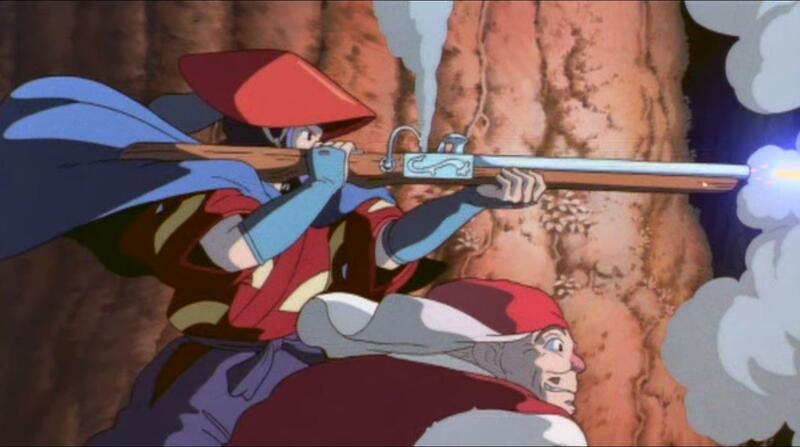 I dunno, it seems like they would be too UP if they didn't use the speedier flintlock technology. However, that's just my opinion. I wouldn't go with semi-auto. That's not how ballistae work. It's literally a crossbow on a mount - No faster, just stationary and meant for home defense. I know, but it would be pretty cool if it worked like an ancient semi-auto mounted weapon that could fire several times before reloading. Imagine a player charges your base: You run over to your ballista (which I would imagine working like HL2's mounted emplacement guns), load bolts into it, and open fire. Ballistae are essentially gigantic crossbows fixed to something. They can be mounted on to a horse-drawn cart for a mobile assault - something minecraft could simulate with minecarts. Fix a ballistae onto a cart, mount it, and start trundling a long, firing at players or mobs...It should technically be powerful enough to break weak blocks like sand, dirt, grass, gravel...and definitely able to shatter through glass and glass panes. Semi-auto is something that would absolutely break these, given how powerful they are. I thought we had determined that Minecraft's time-frame was post apocalyptic. We have sufficiently advanced technology ("magic! "), solved string theory/dimensional travel, and the ability to turn wood and diamonds into speakers and rotary turn-table.